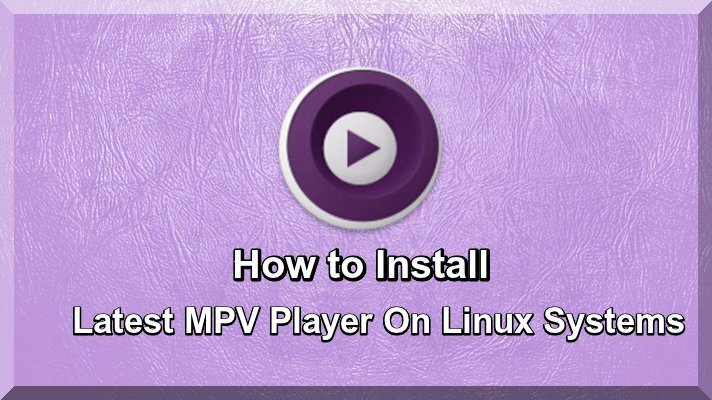 By this useful article I guide you that how to install mpv Media Player on latest Linux basis systems such as latest Linux and latest Ubuntu. This Player is tonally free and open source Multi platform Media Player which was divided from mplayer2 and MPlayer. It will support all modern system and removed large portions of code originating from MPlayer to make it user friendly and introduced lots of new features and improvements. The latest version of MPV 0.17.0 was released which important improvements. You can install it and for better entertainment and enjoyment of movies. How to install it now I guide you step by step with following suggestions. This player will be support on following features.You can also install sView stereoscopic 3D Video Player, MPlayer, SMPlayer, VLC Media Player on Linux distros. GPU video decoding: mpv leverages the FFmpeg hwaccel APIs to support VDPAU, VAAPI, DXVA2, VDA and VideoToolbox video decode acceleration. Embeddable: A straightforward C API was designed from the ground up to make mpv usable as a library and facilitate easy integration into other applications. Streamlined CLI options: MPlayer’s options parser was improved to behave more like other CLI programs and many other option has been reworked to make a new identity and uniqueness on MPV. On Screen Controller: There is no official GUI for MPV, which was having small controller. It has been managed by mouse moment. High quality video output: mpv has a OpenGL based video output that is capable of many features such as video scaling with popular high quality algorithms, color management, frame timing, interpolation, etc. Active development: mpv is under active development, focusing on code refactoring and cleanups as well as adding features. Now how to install MPV Player on Latest Linux Mint and Latest Ubuntu versions to use the following command in terminal. How to install MPV Player in Latest Fedora Linux Basis System to use the following commands. How to Install MPV Player on Latest Debian Linux Basis System to use the following command in terminal. How to install MPV Player on OpenSUSE Linux Based Systems to use the following command in terminal. In view of the above, you like this Video Player for Latest Linux Based Systems, if you can like other Video Players, read more tutorials.on Linux basis systems.